Nothing you are about to read will change at all no matter what Congress and the President finally agree to do in the never-ending circus of health care reform. A stratified system where privilege rules, and others wait, stays in place, unscathed. Primary doctors will not increase, nor will preventive care, nor will government assistance as envisioned by President Obama make a meaningful difference in the lives of anyone. Most doctors want nothing to do with Medicaid patients—indigent or otherwise. You see, in the end, doctors decide who they see. Deb Lustman was late getting to work a few days every week, and often felt she wasn't thinking as clearly as she once did. The reason: Lustman, 50, was spending four hours a day, three days a week, undergoing kidney dialysis at a dialysis center, where a machine filtered toxins and fluids from her blood. Normally, that's the job of the kidneys, but for reasons doctors have never figured out, hers had failed. Steve Lustman helps his wife, Deb, as she inserts a needle into her arm to start dialysis at home in Magnolia, N.J. Only 8% of dialysis patients in the USA treat themselves at home. Nine months into her treatment, as soon as her doctor raised the possibility of home dialysis, Lustman decided to switch. So, in July 2008, after she and her husband learned the ins-and-outs from a nurse, she began dialyzing five evenings a week at her Magnolia, N.J., home, with her two Maltese, Sophie and Jake, often lounging next to her. Now Lustman, an optician, dialyzes on her own schedule, not the center's, and she's not late for work anymore. And, she says, "I'm healthier." Do We Need to Abandon High Ultrafiltration Rates in America? Dialysis practices around the world differ significantly from the practice patterns observed in America and many have long believed this is in part the explanation for our higher dialysis mortality. I recently spoke with a manager of a dialysis unit and his experience with horrified Japanese patients who couldn't believe the blood flow rates used in America compared to Japan. Japan, Europe, Australia and New Zealand have long recognized the survival benefits of longer, slower and gentler dialysis compared to our American style violent sessions. 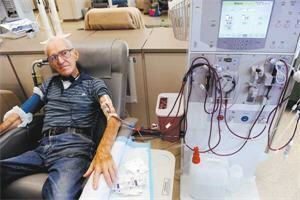 News that Fortune 500 company DaVita Dialysis is moving its headquarters to Denver socked its competitors like a punch in the gut. To its rivals, the kidney-care giant is a bully armed with high-powered attorneys who use lawsuits as tools to intimidate. DaVita executives counter that they are simply strong competitors — they act as aggressors only when doctors or nurses or other dialysis companies break promises and double-cross them. Either way, a string of DaVita-filed lawsuits around the country — with two major battles boiling in Denver and Colorado Springs — shed light on the ruthless competition over dialysis patients in an industry that costs Medicare alone more than $8 billion per year. For years, DaVita's competition in Colorado's two largest cities was almost nonexistent.